Peel pears. Core pears from bottom, leaving stems attached. Place pears upright in 3 1/2- to 5-quart slow cooker. Mix remaining ingredients except cornstarch and orange juice; pour over pears. Cover and cook on high heat setting 2 to 2 1/2 hours or until tender. 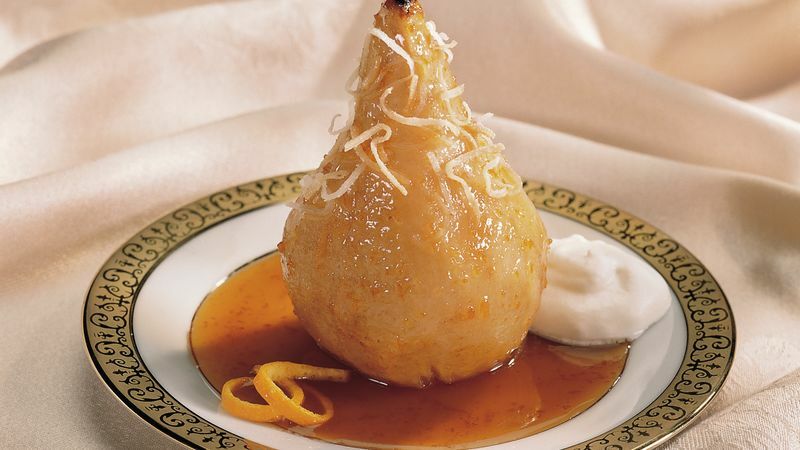 Remove pears from cooker; place upright in serving dish or individual dessert dishes. Mix cornstarch and orange juice; stir into sauce in cooker. Cover and cook on high heat setting about 10 minutes or until sauce is thickened. Spoon sauce over pears. Note: This recipe was tested in slow cookers with heating elements in the side and bottom of the cooker, not in cookers that stand only on a heated base. For slow cookers with just a heated base, follow the manufacturer’s directions for layering ingredients and choosing a temperature. Serve an elegant dessert! Place each pear upright on a pretty dessert plate. Spoon the sauce around the pears, and sprinkle with chopped toasted nuts or coconut. Spoon a big dollop of soft whipped cream alongside the pears, and garnish the plate with a twisted orange slice. For a honey of a pear, use 1/4 cup honey instead of the maple syrup for a sweet change of pace.